Essentially, what you have on 'House Of Dreams' standard melodic rock fare. JLT is an top form as usual and I found him most compelling on 'The Spirit Inside,' 'I Found Love,' 'Say You Will,' and 'Forever Now.' However, 'Walk On' is the true star of the album: the arrangement is brilliant and Turner is passionate. The album weighs heavy on the ballad side (at least six of eleven songs) than the rock side. This was a little disappointing for me even though all the songs are quite good. Joe Lynn Turner's second Sunstorm project 'House Of Dreams' is another fine collection of melodic rock songs from one of the best at it. Basically, it's more of the same. But in the case of Turner and Sunstorm, that is hardly a bad thing. Recommended! 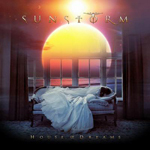 Joe Lynn Turner's second Sunstorm project 'House Of Dreams' is another fine collection of melodic rock songs from one of the best at it. Basically, it's more of the same. But in the case of Turner and Sunstorm, that is hardly a bad thing.